Today, my thoughts keep wandering back to roses… I have no idea why! Maybe it’s the Absolis by Patyka Damask Rose Toning Lotion that landed on my table in the morning. Or the fresh batch of rose water I made last evening… the lush fragrance is still wafting through my rooms. Or the Lancôme Absolue L’extract Regenerating Ultimate Elixir that I have been road testing. Whatever the reason, roses are everywhere in the beauty world right now. And these fragrant flowers are doing far more than just charmingly perfuming our products: their delicate petals are also chockfull with antioxidants, which help heal skin and reduce inflammation. Plus, they have superb antiseptic and antibacterial properties, making them ideal for a number of skin problems. In fact, roses were a prominent element of traditional Indian, Chinese, Persian, Arabian, Egyptian, Greek and Roman medicine before making their way to European apothecaries. Which set me thinking: wouldn’t it be amazing if we could harness the therapeutic properties of this precious plant right at the source? Make its beauty benefits even more potent by adding fresh roses to the mix? So, to help you enjoy a little petal power, here is a bouquet of rose-based lotions, potions and scents. And since roses are said to banish melancholy, I hope these beauty recipes also help to chase away the mid-week blues for you! Use the freshest flowers you can find – ideally, they should be picked on the same day. Where the recipe calls for rose water, you can buy it from the market (look for organic versions) or make it yourself with these easy recipes. Look for organic or pesticide-free blooms since these will be applied to your skin. How-to: Gently rinse 1 cup rose petals to remove dust. Grind the petals as finely as possible, using mortar and pestle. 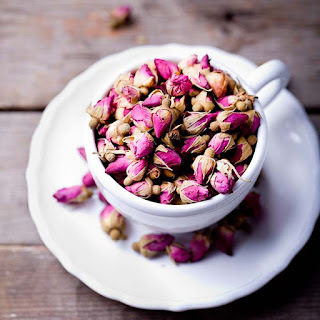 Mix the ground rose petals with 1 teaspoon sea salt, 1/4 cup rolled oats, 1/4 cup 1/4 cup buttermilk powder, 1 teaspoon cornmeal and 3-5 drops of rose absolute oil. Pour everything into a food processor and process until you have a fine mixture. Add just enough olive oil to create a paste when you want to use the scrub. Store remaining mixture in a lidded container. The science: Roses boost the body’s circulation, while simultaneously purifying the blood by flushing out wastes and toxins. 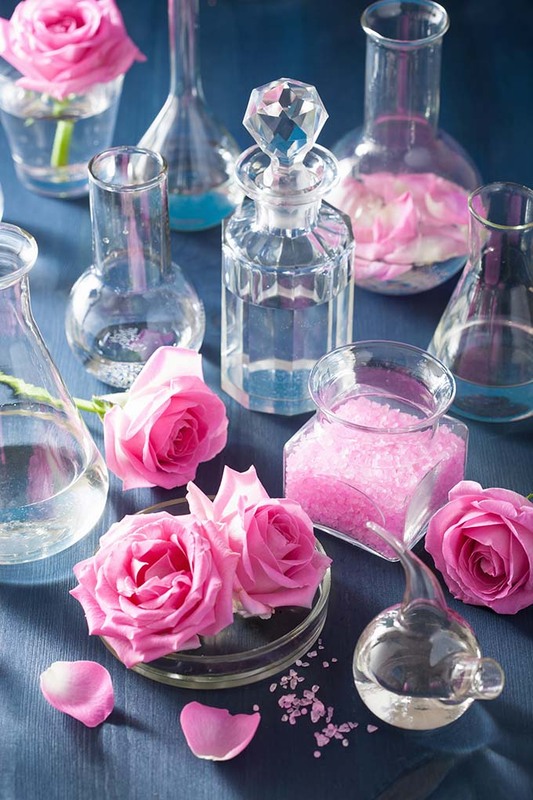 How-to: Mix together 3 cups Himalayan pink salt, 3 cups Epsom salts, 1 cup baking soda, 2 cups rose petals, a few drops of glycerin and 1/2 teaspoon rose absolute oil. Add the blend to a warm bath, then slip into the tub and relax for 10-15 minutes in fragrant bliss. The science: Rose petals are a staple in Ayurvedic medicine to calm, clear and soothe both mind and body. How-to: You’ll need 1 cup of rose petals (2-3 roses) and 1 cup of almond oil (rich in vitamins E and D, yay!). Put the petals in a jar, crush them up a bit with a wooden spoon and pour in the oil. Let the mixture sit for 1 week, then strain and use. This feels so good right out of the shower and smells delish! The science: Rose oils help reduce swollen spots or redness on your skin. Its calming properties can also help sooth rosecea and eczema. How-to: Mix together 1 cup rose water, 6 drops of glycerin and 3/4 cup witch hazel. Pour into a sterilized bottle. To use, moisten a cotton pad with the rose toner and swipe all over your face after cleansing. The science: As a natural astringent, roses help tighten pores and restore suppleness for a glowy complexion. Unlike conventional alcohol-based toners, this leaves skin feeling smooth, not dried out. Plus, the addition of glycerin and witch hazel make this recipe astringent and hydrating. How-to: Mix together one teaspoon of honey, 6-8 rose petals, two teaspoons rose water and one teaspoon plain yogurt; stir till you have a smooth paste. Apply this on your face and neck and wait for 10-15 minutes, then rinse with warm water. Skin will feel super-hydrated and shall recover its lost nutrients. The science: The natural oils found in roses help lock moisture into the skin, keeping it silky smooth. They are especially good for sensitive skin because the sugars in rose petals soothe the complexion. How-to: Mix 3 tablespoons of rose water with 1 tablespoon of plain yogurt and 2 tablespoons of oat flour. Apply this paste for about 20 minutes and then wash it off with lukewarm water. Your skin will be deep cleansed and feel super-supple. The science: The naturally antibacterial rose water is great for treating acne and acne-prone skin. Plus, the sugars found in rose petals add to their soothing effect, helping calm down troubled complexions. How-to: Pour 2 cups of rose water in a small mixing bowl. Then break 2 vitamin E capsules and squeeze their contents into the bowl. Add 4 teaspoons each of olive oil, honey, coconut oil and rose water. Mix well and transfer to a container that has a lid. Refrigerate when not in use. The science: Roses contain high amounts of vitamin C – a powerful antioxidant that can help strengthen skin cells and regenerate skin tissue. It also helps protect skin cells from sun damage other environmental toxins, thereby preventing premature ageing. How-to: Mix 1/3 cup glycerin and 2/3 cup rose water. Store in cool dry place. The science: Rose oils are not only incredibly moisturizing, they also help stimulate circulation in the skin while simultaneously tackling thread veins and broken capillaries. How-to: Well rinsed and lightly blotted rose petals ground with beeswax can heal dry lips. Keep in a small covered tin to apply easily throughout the day. The darker the color of the rose, the darker your lips will become. The science: Roses contain high levels of vitamin C, oils and proteins, which help keep skin soft and moisturized. Plus, it has retinol (vitamin A), which treats lines, wrinkles and other visible signs of aging. 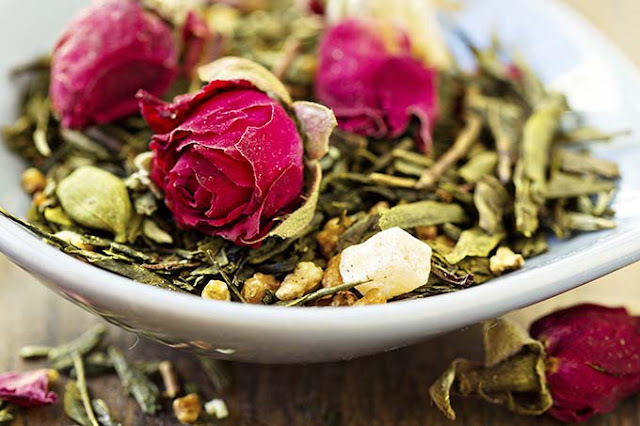 How-to: Combine 4 cups boiling water, 1 teaspoon dried hops, 1 teaspoon stinging nettle, 1 teaspoon fresh rose petals, 1 teaspoon dried strawberry leaves, 1 teaspoon walnut leaves and 3 tablespoons dried sage leaves. Cover and steep for an hour. Strain and sweeten with honey if desired. Besides being aromatic and calming, this tea can also reduce excessive perspiration. The science: Rose oils inhibit water loss from the skin and lower the concentration of cortisol (a stress hormone) in the body. What are your secret recipes – or product picks – for these pretty petals?